May begins a season of commencement ceremonies throughout Webster University's global network of campuses. The largest was the 97th Annual Commencement at The Muny in Forest Park in St. Louis, where Webster was founded in 1915. Over 1,000 graduates attended that ceremony, including about 140 who earned their degree at campuses throughout the world or online. With this milestone also comes time to reflect on the accomplishments of the journey to an academic degree or certificate, and all the people who helped along the way. 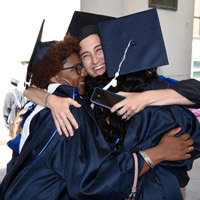 For the ceremony at The Muny, we interviewed new alumni about the people on their minds at this turning point in their lives. Also check out the earlier video of how students and faculty savored the moment at Commencement. Visit the following campus Facebook albums for photos of last weekend's ceremonies in St. Louis, Geneva, Leiden, Orlando, Florida.